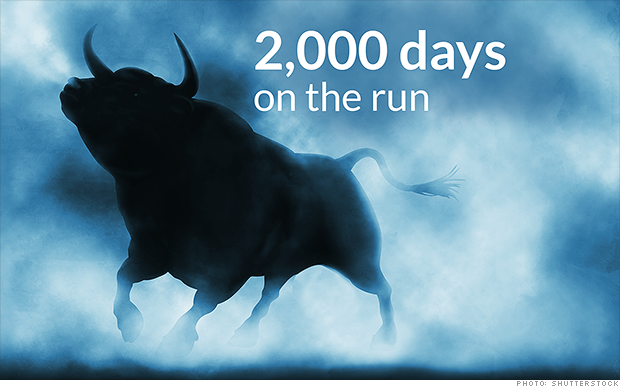 The current bull market run in U.S. stocks has now crossed over 2000 days, making it 5.5 years old. It is the fourth longest in history (trailing only the 1949, 1974, and 1990 runs). The average bull market in U.S. stocks is 3.16 years and the median bull market is 2.16 years (a bull is considered over after a 20% decline or more). It would surprise many to know that the current run of consecutive months with job gains in the U.S. is the longest in history. The next three occurred in 1989, 2000 and 2007. I find this second statistic and the chart above fascinating. 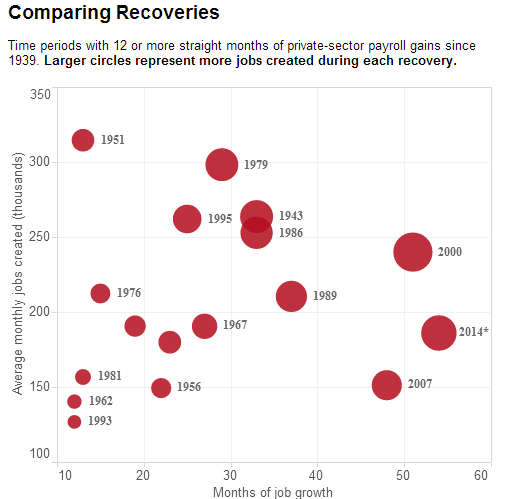 You'll notice that the top 4 runs of consecutive job gains all occurred within the last 25 year period. I believe three major factors account for these recent record runs (these are broad strokes; it would take numerous books worth of writing to discuss this subject in its entirety). The first is that the government changed the definition of employed and unemployed in the early 1980's. If you are a Realtor that makes no money and works with a customer for 2 hours one month, you are considered employed. The same goes for a part time worker at 20 hours a week who is seeking (and probably needs) full time work. 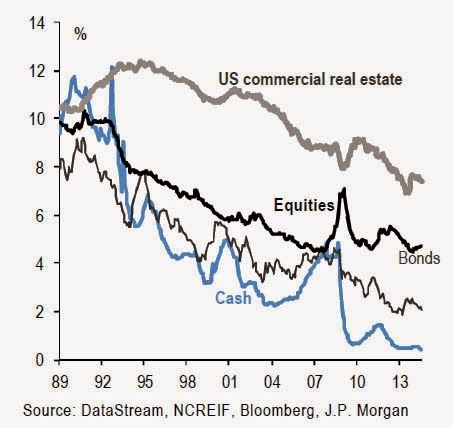 The second factor is the stimulating effect of declining yields on assets over the past 32 years. The cost to take on debt has declined steadily alongside commercial real estate cap yields (falling cap rates equal higher prices, see Commercial Real Estate: How Prices Are Determined). The ability to borrow more has turbocharged the entire economy while the real estate industry has created an army of jobs over the past few decades (if rates were to begin rising this stimulant would become a depressant and many of these jobs would disappear). The third factor that has turbocharged the recent job runs has been the involvement of the Federal Reserve and federal government in the economy. In the early 1980's the American government began to run massive deficits in order to stimulate the economy. In the 1990's these deficits were combined with loose monetary policy in order to stimulate growth. In the 2000's the two continued to be used together only on steroids. Today the world does not even remember a time when the U.S. government or Federal Reserve were not solely responsible for the growth within the U.S. economy. The "new" economy has become such a perverse creature of its former self that it looks like a meth addict continuously seeking its next hit. Greenspan said that we entered a period of "Irrational Exuberance" after the stock market crossed 100% of nominal GDP back in 1996. The only problem is that due to these combined stimulant/drug injections into the economy we have been above that point almost every moment since. The real wash out has not arrived yet. We know what happens when booms are artificially juiced to run longer than they naturally would; the busts become equally larger on the downside. Here is the chart that illustrates Saut's permanent earnings growth. No more recessions. Market cycles no longer exist. Do you see on the chart above how previous earnings booms were followed by an equal or greater bust? 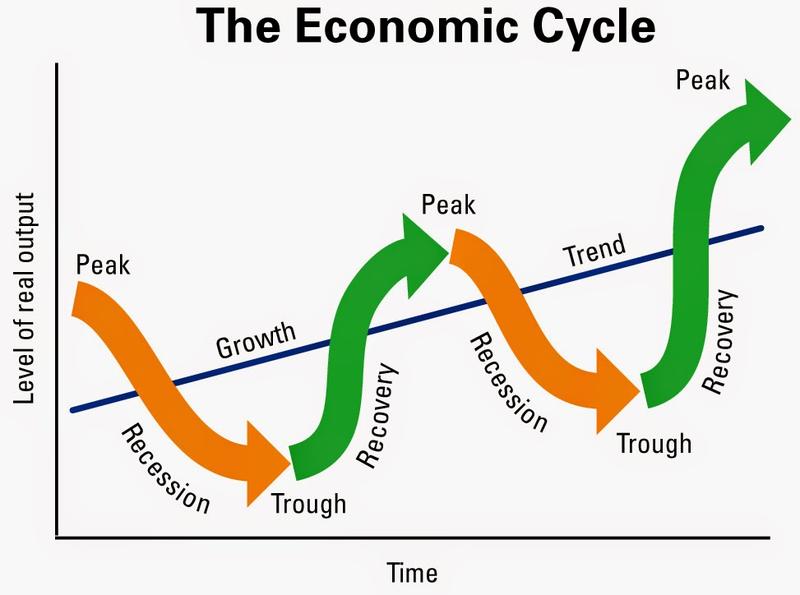 This is the natural cyclical flow of an economy. Expansions lead to contractions which wash away the excess and create the foundation for the next period of expansion. Over the past two years companies in the United States have been discussing how they are bringing their manufacturing back to domestic producers because the cost is equal or below the bids they are receiving in China. The chart below illustrates how China has rapidly caught up with the United States in the cost to produce goods (great news for America, not great news for China). There are only nine countries now less expensive than the United States. Mexico and India are less expensive than China which had provided a boost to their overall economies in recent years (and should continue to help moving forward). Indonesia is the most attractive producer in Asia. The price of labor in Europe makes their manufacturing costs less competitive. That is already correcting itself as wages are in free fall due in large part to massive youth unemployment (the invisible hand working). 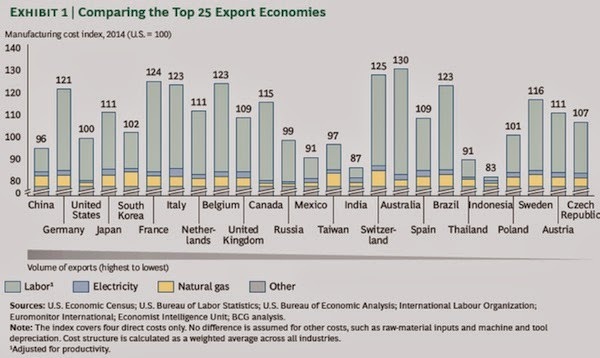 Japan, a country heavily dependent on exports, carries a higher cost burden than many of the Asian exporters. This is part of the reason why Japan (along with Europe) is so focused on reducing export costs through currency devaluation. A reduction in the value of your currency is like a magical reduction to the cost of your exports with no wage reductions needed. The chess pieces will continue to move as the currency wars rage throughout the remainder of this decade (and possibly beyond). I believe that when the smoke clears the Japanese yen will experience the greatest losses while gold and silver will experience the greatest gains. The market continuously moves through a steady psychological cycle of human emotion. During the depression stage of a market decline no one wants to admit they own the asset, and they can only discuss the potential risks of the market moving lower. This is the absolute best time to begin accumulating a position within that asset class (examples in today's markets would be precious metals, agricultural grains, uranium stocks and the Russian ruble). As prices rise and investors gain confidence psychology slowly shifts until it reaches the complete opposite end of the spectrum. During this period, usually between thrill and euphoria, the fear that prices could potentially move lower is completely washed away. We are at this psychological point for U.S. stocks. At this stage the mainstream media likes to lump together a group of talking heads like a firing range to verbally assault anyone left on the planet who could potentially even think about not having their clients "all-in" U.S. stocks at current nose bleed price levels. This week CNBC brought on Bill Fleckenstein who created a short fund at the peak of the stock market back in 2007 (a short fund profits when prices fall). 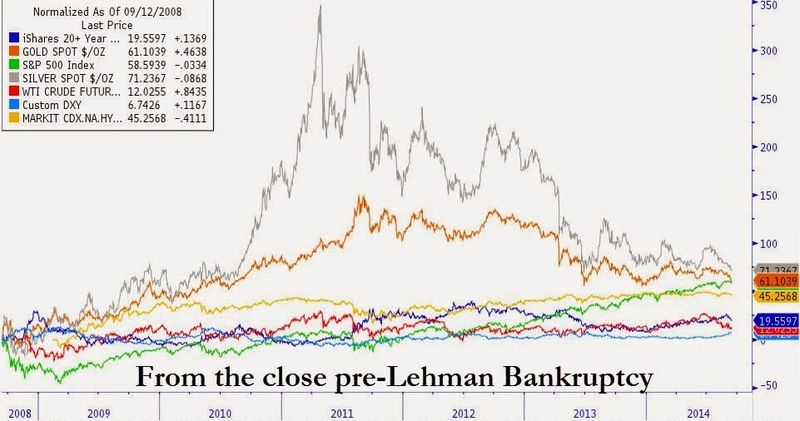 He closed his short fund in February 2009 (the market bottom) because he felt central banks would print an enormous amount of money and stocks would experience a relief rally. This would probably be the closest example available of an analyst who has a complete understanding of monetary policy and its impact on the financial markets, however, the CNBC host tells Fleckenstein he misunderstands monetary policy, at which he can only laugh. The remaining portion of the segment consists of the three U.S. stock bulls assaulting Fleckenstein relentlessly for not currently being 100% long U.S. stocks. Fleckenstein is currently in the early stages of opening a new short fund to capitalize on the U.S. stock market's next collapse, just as he did back in 2007. Mark Cuban discusses the value in funding startups outside of Silicon Valley, the desire to win in the business world, Cyber Dust and Shark Tank. It's no secret that Cuban, who appears on this site often, is one of my favorite business personalities in the world, and I listen to and read his thoughts/advice at every opportunity. A slightly different tone than what we currently hear from the rest of the financial world which has already booked 20% plus annual returns for at least the next five years by staying 100% invested in U.S. stocks. We'll check back in a few more years to see how things have progressed from here. My guess is there will be less mocking of Faber on CNBC for admitting he owns a portion of his portfolio in precious metals. 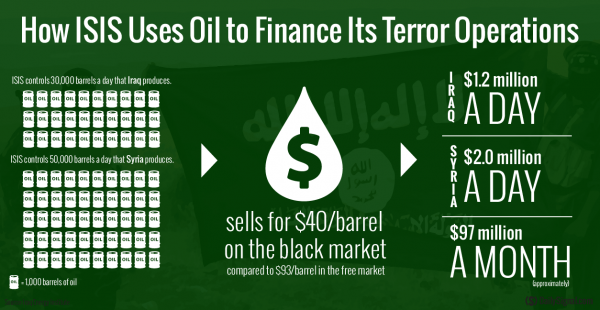 The four minute video below provides a primer on the ISIS group.